A Bluestem Prairie: Does Matt Stolle of the Post Bulletin want voters in the dark about Davis's positions? Does Matt Stolle of the Post Bulletin want voters in the dark about Davis's positions? With Wall Street and the stock market in turmoil, almost no one these days is talking about privatizing Social Security. Well, almost nobody. When there is a discussion, it is usually about how the other guy or gal wants to privatize the system. Such was the case when supporters of DFL Congressman Tim Walz held a press conference this week to highlight and criticize his GOP challenger, Mayo Clinic doctor Brian Davis, for supporting such a concept. Davis said his campaign sees room for growth in those numbers. That's because while Walz is a known quantity to the district, Davis says he is a candidate still introducing himself to voters and thus has the potential for improvement. We're curious. Does Matt Stolle think it's better for voters to be ignorant of Davis's ideas about Social Security as he introduces himself? How is the reading public served by having Stolle only write about the signature issue Davis selects? Really, Mr. Stolle, what was your point in implying that silence about a candidate's position is somehow healthy for the political process? Perhaps the Post Bulletin could publish a memo outlining which issues are on the table for reporting in the Walz-Davis contest. After all, with Americans worried about their investments and nest eggs, it's not as if we should be talking about retirement programs now, right? 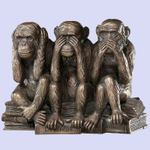 Image: Is the new Post Bulletin policy "see no evil, hear no evil, and speak no evil" about Brian Davis? Will readers be getting a list of the Republican candidate's positions that are acceptable to be brought to the voters' attention? Have you heard (or read) the September 24 story on KAAL ? The discussion concerned Social Security and Davis says privatizing, or allowing some of the payroll taxes to be invested, would be one way to help. "So let's say 40% or 50% of payroll taxes could be included into a secure type of even a 403B plan, which would be bonds and securities that are very stable," says Davis. Yes, some citizens are concerned ... rightfully ... and they may support Congressman Walz, but KAAL asked the question. I am concerned with your paragraph "The program's trustees have projected that Social Security will begin paying out more benefits than receipts in 2017. It will be financially exhausted in 2041." Dr. Davis may be taking a preemptive strike since he knows that one way to increase funding for the reserve is to increase the taxable cap rate. Interesting that Dr. Davis, who is capped on how much he contributes to Social Security (currently set at $102,000 and in 2007, Davis was paid $411,780), is willing to allow workers to accept some risk. Also I am confused with Davis comment "the Democrats have been taking money out of that". To my understanding Social Security reserve is still being funded ... and the Government's overall balance sheet is not in as bad a position because of the positive balance in the SS reserve. This has been the case forever ... and some of your readers will recall the Bush/Gore debate over how to whether a "lockbox" should be established so that the Government does not imply a better fiscal year statement by not recognizing the positive impact of Social Security overfunding. The overall fiscal balance sheet would look worse if the reserve for Social Security payments weren't used to offset other funding (such as Iraq). Why is Davis blaming the Democrats when President Bush and Congressional Republicans share some of the blame ? But the good thing is that these citizens that prompted your article are addressing a concern. Let's not be so quick to minimize thier concerns ... if Davis is elected, at least voters know what his plans are.